Here you can find some of the works done by the students! Have fun! Just like most of the Portuguese people, we love football! Here's the work we have done about our favourite teams. Hello! We are Benfica fans. Benfica’s stadium is located in Lisbon. Benfica team was created on the 28th February of 1904. The best football player is Jonas with 18 goals in the 2015-2016 league. Benfica’s mascot is an eagle. The main colours of the stadium are red and white. In 2014 it was considered a beautiful stadium. The stadium is very big and it is one of the biggest stadiums in Europe. The president is Luís Vieira and the coach is Rui Vitória. And you? Do you like football? Sporting is a Portuguese football team. It was named after José Alvalade, its founder. It took him four years to create this team. Since 1906, Sporting has been a great team. The couch of the team is Jorge Jesus. Its president is Bruno de Carvalho. Sporting has three gold medals and a silver medal. Sporting has played some championships: “Primeira Liga”, “Taça de Portugal”, “Taça da Liga”, “Liga dos Campeões” and “Liga Europa”. It has a stadium too and its name is Stadium José Alvalade. It has a capacity for 50 095 people. The stadium is in Lisbon. Sporting has a museum with more than 5000 trophies. We love Sporting because its players play very well and it is 109 years old. Our favourite team is Porto. FC Porto is a Portuguese sports club based in the city of Oporto. It's best known for its professional football team which plays in the First League. This club was founded on the 28th September 1893. On 22nd of May 1999, FCP was pent champion. The president of Porto is Jorge Nuno Pinto da Costa and the coach is José Peseiro. The stadium is called Dragon´s Stadium, it was built for Euro 2004 and was created by the architect Manuel Salgado. It has a capacity for 50.000 people. We love FCP. 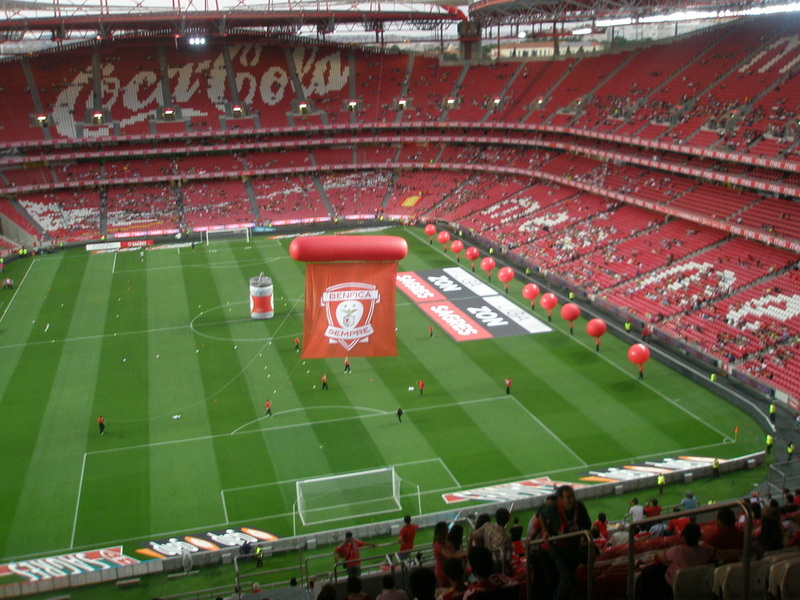 Benfica’s stadium is called Luz. This stadium opened to the public on the 25th October of 2003. Benfica’s coach is Rui Vitória and the president is Luís Filipe Vieira. The colours of the stadium are red and white. The club crest is grey, white, yellow, blues, green, and red .It has eagle on the top. Benfica is our favourite. We love it. Work done by Guilherme, n.º 4; Rodrigo, n.º 17, and Rui, n.º 18. We are Benfica fans and we live in Sever do Vouga, Portugal. Benfica is a Portuguese club. 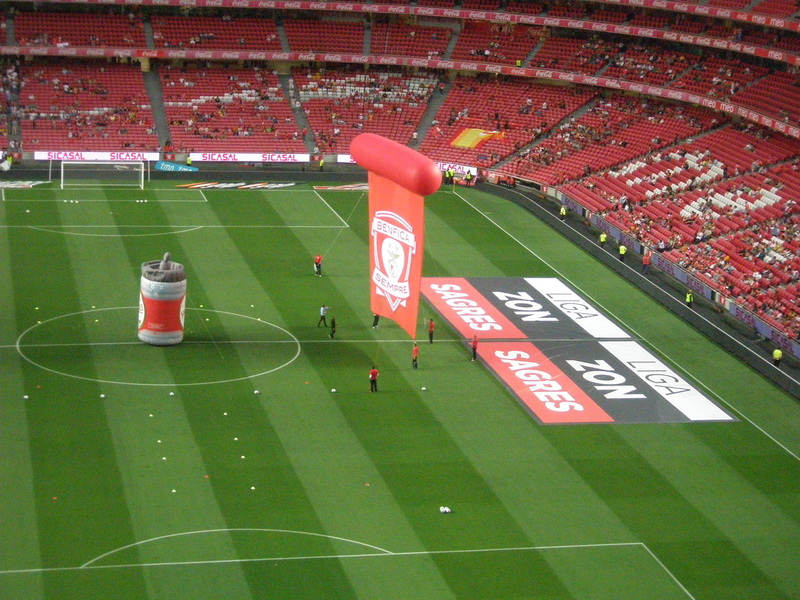 The “Luz Stadium” is very beautiful. 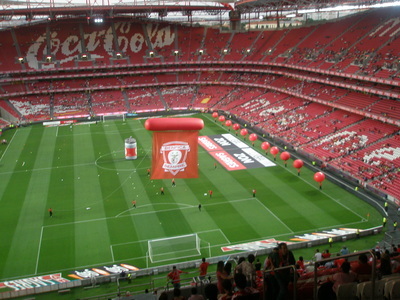 Benfica stadium is located in São Domingos de Benfica, Lisboa, Portugal. Our club’s crest is blue, yellow, red and white and it has an eagle. Benfica was founded on the 28th Februery 1904, under of the name “Sport Lisboa” Now the couch is Rui Vitória. It is Christmas Eve. It is snowing outside. The three baby bears, Mary, Perry and Jerry, are at home in the North Pole. They live in an igloo. They are alone. Their parents are dead. They are hungry, cold and sad. Suddenly, the strong wind destroys the igloo. The bears are crying. – What about now? – says Mary, the older sister. – Let’s ask Santa for help. They go to Santa’s house. They knock, knock, knock. Knock, knock, knocking on Santa’s door. Santa and the elves are not at home. The three bears go inside. They start baking cakes for Santa Claus. When Santa arrives he sees a big chocolate cake on the table. He eats it. It’s delicious! – Can we stay here tonight? – ask the three bears. – Yes, you can but you have to bake another cake. Santa Claus doesn’t spend Christmas alone. The three bears are very HAPPY. ﻿ Fat Father Christmas likes sweets very much. He eats biscuits, chocolate cake and gums every day. So he is very, very FAT. Skinny Mother Christmas is very thin. She doesn’t eat unhealthy food. To be honest, she doesn’t eat anything at all. So she is very, very skinny. It’s Christmas Eve. Fat Father Christmas and Skinny Mother Christmas need to deliver the gifts. The children all over the world are waiting. Fat Father Christmas eats so many sweets that he is very tired. Skinny Mother Christmas doesn’t eat much. She is so hungry… So she is very weak. – What about the gifts? The children are waiting!!! – Fat Father Christmas, don’t eat so many sweets! – Skinny Mother Christmas, you are beautiful! You can eat fruit and vegetables. You needn’t be so skinny. Fat Father Christmas and Skinny Mother Christmas decide to do what the elves tell them. They are very happy. Thanks to the elves the children have many gift, Father Christmas isn’t fat and Mother Christmas isn’t skinny any more. ﻿The wolf Ronald and the reindeer Messi are old enemies. They both like to drive Santa’s sleigh. But they drive a different sleigh. 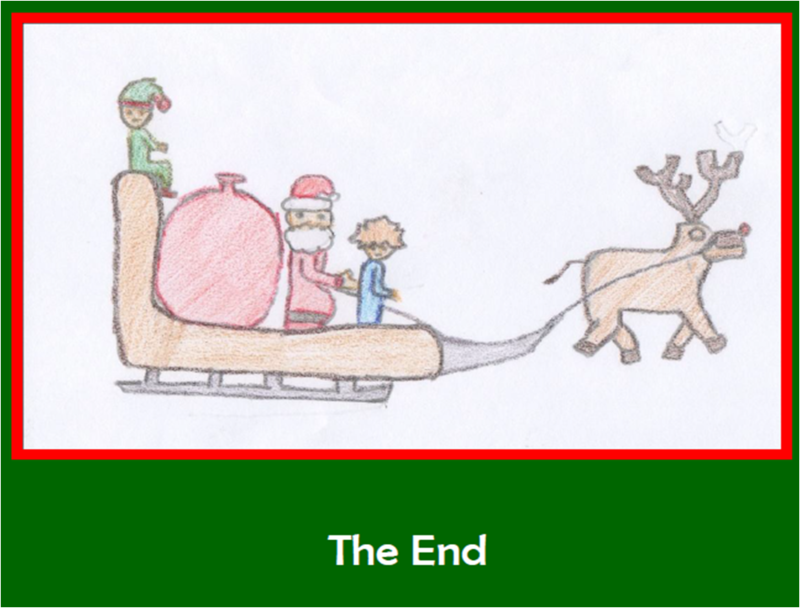 The sleigh that the reindeer Messi drives can fly because Santa needs to deliver the presents in distant places. Today is Christmas Eve. But the reindeer Messi isn’t feeling very well. He needs help to deliver all the presents. – OMG! Who can help the reindeer, Messi? – I know, I know, the wolf, Ronald! So, the wolf Ronald delivers the presents to the children that live near the North Pole. And the reindeer Messi delivers the others to more distant places. Now the wolf Ronald is very happy. He also drives Santa’s sleigh. The wolf Ronald and the reindeer Messi are friends again. CHRISTMAS IS FRIENDSHIP! Julian loves Christmas. Every year he tries to stay awake to see Santa Claus, but he always falls asleep. But this year things are different: he is going stay awake watching TV. Oh no! Julian can't stay awake! He is asleep. But ... suddenly, he listens to a big noise and he opens his eyes. He can't believe what he sees! A real elf in front of him! – Ups! I know you are surprised to see me, but I`m Santa Claus’s helper. I fell from the chimney and I`m hurt. Please help me! – says the elf. – A real Santa’s helper! I can help you, let me see those wounds. My mother has got a first aid box in the bathroom. Come with me! – says Julian. – Thank you! – says the elf – My name is Elvis. I’m Elvis, the elf. I’m happy to meet you, but I must find Santa Claus. Let’s go outside. Julian and Elvis go outside and look for Santa Claus but they don’t see him immediately. Yet, Julian listens to some bells. – Listen, Elvis. I think I can hear the reindeer’s bells. Santa Claus is behind the house. – says Julian. – Ho! Ho! Ho! Here you are, Elvis! I was worried about you! - says Santa Claus. – Look, Santa Claus, this is my new friend. He saved me! – says Elvis. – Hello Julian! Nice to meet you! You helped Elvis, the elf. As a reward you will deliver the presents with me. – says Santa Claus. – Thank you Santa Claus! This is the best Christmas ever!